Hex head bolts, also known as hex head cap screws, have hexagonal heads and machine threads for use with a nut or in a tapped hole. Our Hex Head Cap Screws come in steel hex head caps screws, stainless steel hex head caps screws, aluminum hex head caps screws, silicon bronze hex head caps screws and miltary spec hex head caps screws. Our steel hex head caps screws are available in grade 2, grade 5 plain, grade 5 zinc plated, grade 8 and grade 9. Our stainless parts come in 18-8 stainless steel hex head cap screws and 316 stainless steel hex head cap screws. 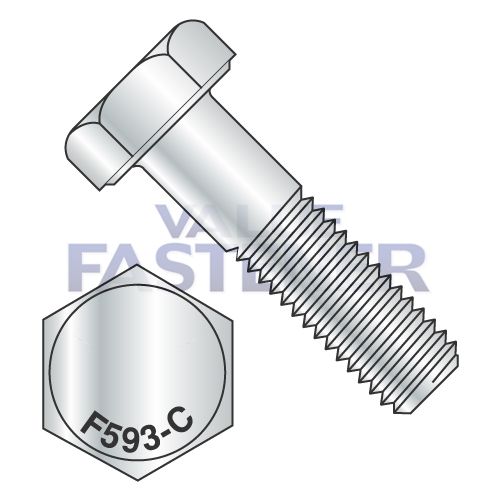 To accompany our line we also offer a wide variety of metric hex head cap screws. To complete our line we offer military spec hex head cap screws in various ASME and MS specs. All of our Hex Head Cap Screws can ship within 24 hours. Most orders with ship same day!